The production of Rent currently playing at the Hayes Theatre Co sold out before opening. As announced last night at the Hayes’ Coming Soon launch for the first half of 2016, the show will have a three-week return season from March 29. The rock musical with music, book and lyrics by Jonathan Larson – who died on the eve of its 1996 off-Broadway opening – quickly gained a cult following. It won a Pulitzer Prize, moved to Broadway and then onto the world, including Sydney where a production played at the Theatre Royal in 1998. 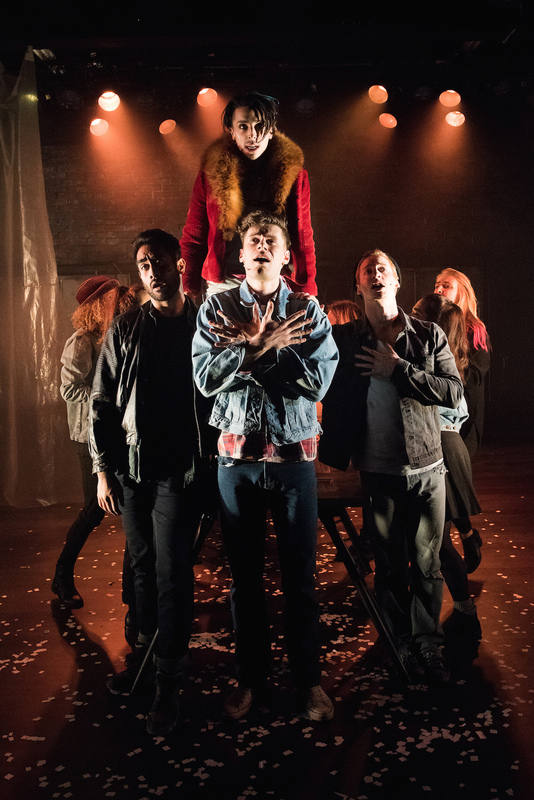 Loosely based on Puccini’s La boheme, Rent is set in Manhattan in the early 1990s and centres on a group of impoverished young artists and misfits who are struggling to survive as gentrification makes rents unaffordable and AIDS takes its devastating toll. The musical is an explosion of passion, anger, sorrow, frustration and defiant joy. Produced here by Highway Run Productions (Toby Francis and Lauren Peters) in association with the Hayes, helmed by first-time director Shaun Rennie and performed by a strong cast of 14, the production certainly pulses with youthful energy but it often feels over-busy, particularly in the first act. That’s partly to do with the musical itself, which has a rather loose, disparate structure, following a number of different characters through several interconnecting story lines. Central to the group are Mark (Stephen Madsen), a middle-class, would-be filmmaker, his roommate Roger (Linden Furnell), a songwriter with HIV and writer’s block whose girlfriend committed suicide, and Mimi (Loren Hunter), a drug addicted club dancer, who also has HIV. There’s also the cross-dressing, joyously queer, gently caring Angel (Christopher Scalzo) and Collins (Nana Matapule), a gay anarchist professor, who fall for each other, Mark’s former girlfriend Maureen (Laura Bunting) and her new partner Joanne (Casey Donovan), and Benny (Matthew Pearce), a former friend of Mark and Roger who is now their tough landlord. With an ensemble that also includes Denise Devlin, Josh Gardiner, Jack O’Riley, Kirsty Sturgess, Monique Sallé and Chloe Elisabeth Wilson playing various other characters, there’s a lot going on, with important pieces of information often conveyed very briefly in a line or two of song. Depending on where you sit in the theatre, there are sound issues, with the cast belting it out of the park to be heard over the band, and lyrics often hard to decipher. Rennie doesn’t manage to control the focus completely in the first act and it all feels as if it is coming at you at a million miles an hour, while the actors struggle to create strong, clearly defined characters as they sing full-bore. Scalzo as Angel and Matapule as Collins, are the most successful at creating truthful characters we care about and their relationship is very much the heart and soul of the first act. The second act is much more successful across the board. For a start, the musical itself quietens a little and the storylines are given more room to breathe. Furnell really finds his groove as Roger and his relationship with Mimi gains genuine traction. Hunter gives an intense, almost aggressive Mimi but conveys little of her vulnerability until late in the piece, when the production finally becomes moving. Even in the second act there are times when the production feels unnecessarily busy, as when Collins carries the dying Angel from one table to another during Mimi and Roger’s song Without You, for seemingly little reason, which just proves distracting. Then there’s the sign language, which Rennie and choreographer Andy Dexterity use periodically during the production. Many people have loved this element but I couldn’t help feeling it looks like an exercise used in the rehearsal room to explore the characters’ emotions, and probably should have stayed there. For me, it feels imposed rather than organic – though others clearly experienced it differently. However, there is also much to enjoy. Rennie starts the second act in an unexpected way – a delightful, clever touch – and there’s lots of powerful singing. Donovan and Bunting raised the roof on opening night with Take Me or Leave Me and Matapule delivers a lovely version of I’ll Cover You but all the performers all have their moment vocally. 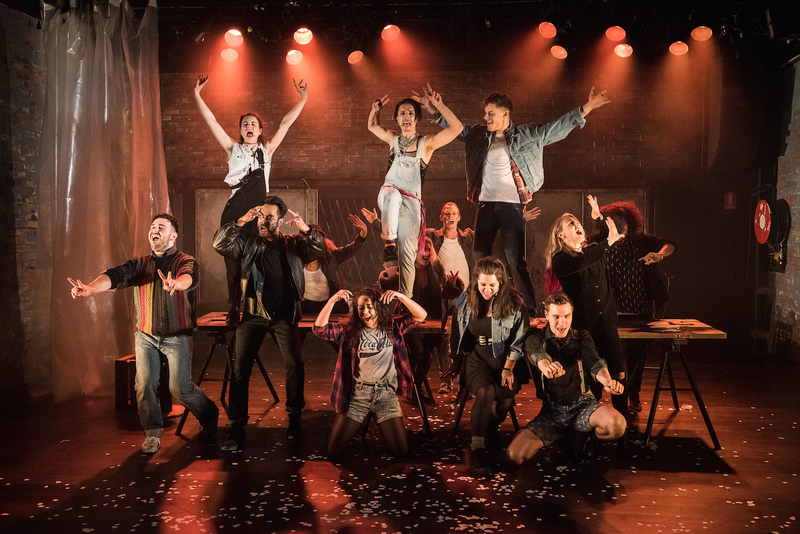 Lauren Peters’ sparse, stripped back set – essentially a bare room with exposed bricks, a few props, and a metal mesh gate in front of the small band (led by musical director Andrew Worboys) – creates the right kind of grungy space, while Georgia Hopkins’ costumes work well. It’s good to see young producers and a young, first-time director being given the chance to produce work like this and you can’t fault the energy and commitment of the cast. With a little more tightening, honing and focusing the production could really hit home so it’s great that the creative team will have the chance to revisit it early next year.